OK, let me first say that fantasy food is so much easier than space food. All you have to do is get some rustic bread, and some cheese, and a nice blotchy apple, and there you are: fit for adventure. So the space larder is a little muddled, by comparison. 1. I think, for the sake of authenticity, I have to get a couple of protein bars which I can then pretend are space rations. Since they aren’t the sort of thing I’d normally eat, I can almost make them seem appealing based on their novelty. They’re like chocolate bars, right? But with a… uniform sandy texture? I guess I’ll find out, some 2am next week. 2. What else is spacey? And ration-y? All I could really think of were mixed nuts, maybe just because I want them. 3. I’ve done a lot of whining about wanting the perfect ginger ale, and somehow fate has never punished me for it; in fact, I’ve recently found something pretty close to perfect, made by a local company, Dickie’s. So this is my excuse to stock up, since my normal budgeting involves never paying for beverages (other than coffee and tea, of course; I tell myself that this balances out my other bad spending habits, even though it can’t possibly). 4. Fizzy water, too: another special occasion purchase. 5. How do I describe these? They’re this puffed kamut square thing… like, if rice crispy squares were made with Sugar Crisp cereal, but marginally healthier? Anyway, a local Vancouver grocery store, Capers, used to make them, and thankfully they still do, even now that the company has been enveloped by the soft maw of Whole Foods. And you know, maybe some Whole Foods regional director will be sitting at their desk, googling this stuff (I’m trying to helpfully add all the search terms) and they will see this reference. In which case, let me tell you, nice, gentle person: you must never let your local stores stop making these squares, or I will die of grief. Thank you! 6. Also, normal rice crispy squares. Puffy cereal held together by sugar, just in general. 7. Last of all, I must have some peanut m&ms. Which aren’t even unreasonable, you know, because after I made this list I did an image search for astronaut food, and there they were, amongst all the shiny vacuumed packages. Official candy of space. Space food is so hard. Maybe some potatoes with condiment packets.. like in The Martian. Or tea, earl grey, hot… or a space muffin? Those potatoes would be some serious, survival-level realness – if only I had that much dedication. I like the “space muffin”, though, that’s more my actual speed. It’s spacey because I say it is. See, that’s perfect, because not only is cheese pretty much the easiest thing ever to incorporate into your life, it also takes a fantasy food and handily converts it to a space food. I’m going to have to get cheese, now, and perform some geometry on it. GEROLSTEINER, magic water! About those peanut M&M’s, of course they are eminently reasonable, peanuts, dontcha know. Best of the fizzies, right? More soothing than chamomile tea. Since reading about the ISS astronauts I think a lot about Indian snacks for my space rations of choice. Small, calorie rich, full of flavour to help living on recycled air. I can’t remember what they’re called but you can get these paper cone twists of handmade bombai mix that feels like a space snack mainly because of the presentation! Thank you for this reference! Those are definitely going in. Damn, yes, feeling pretty good about living my life in standard g.
Poprocks are a pretty good space larder, I think. Maybe inside the space muffin? I did a whole lot of boredom research on this a while back and sadly, the one thing that really stuck with me on space food is that, while you’re in space, your nasal fluids tend to float like the rest of you and sort of clog up your passages. SO, the most popular food amongst astronauts was the shrimp cocktail, due to its horseradishy punch. 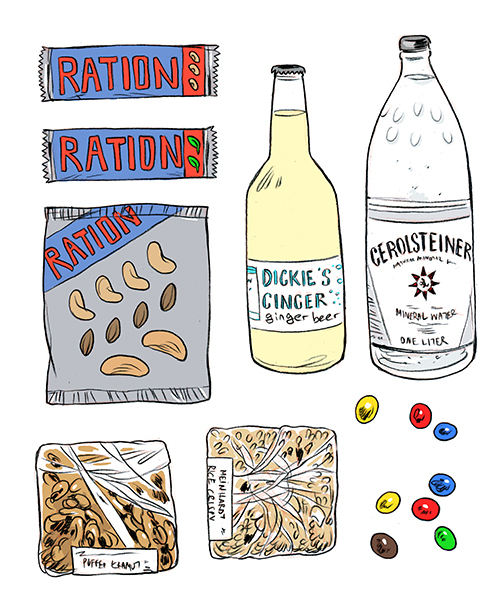 Also, nuts and snack bars are among the snacks astronauts bring with them! Another thing I remembered was that they used tortillas more often than bread, since they were less crumbly, and occasionally (rarely) get fresh veggie/fruit shipments, which is a cause for celebration. Interesting stuff, but another of the many reasons I could never be an astronaut: I love food too much to suffer a constant head cold. You could always go old school and throw some Tang in there. I checked, they still make it! Surprised me, too.